Magna Carta Recent News: Magellan - "Impending Ascension"
Back when I first "re-discovered" progressive rock back in the mid 90's Magellan was one of the first of the modern era bands that I explored. At the time I thought they were incredible. Over the years I have had more mixed reactions to some of the band's latter albums, but this one still remains one of my favorites. 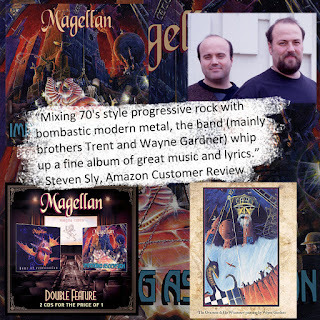 Magellan is pretty typical of the progressive rock label Magna Carta's stable of bands in the 90's. Mixing 70's style progressive rock with bombastic modern metal, the band (mainly brothers Trent and Wayne Gardner) whip up a fine album of great music and lyrics. There are three really great tracks on the disc, and they all top the 10 minute mark. The opener "Estadium Nacional", the 2nd track "Waterfront Weirdoes" and track number 6 "Storms And Mutiny" which tells the story of the band's namesake, the explorer Magellan." Available as part of A specially priced 2 CD set of the first 2 albums by progressive rock band Magellan. "Hour Of Restoration" and "Impending Ascension"
Shadow Gallery - "Shadow Gallery"